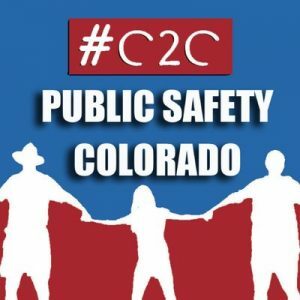 Citizen to citizen (#C2C) public safety reporting is a form of watchdog journalism research displayed through crowd-sourced data-aggregation. Nationwide citizen advocates coordinate individual, nonprofit & for-profit citizen to citizen public safety social media posts, facilitate public dialog, research relevant region or event specific educational materials and marketing programs. C2C national volunteers also coordinate feedback with the coding development team to improve web & mobile interfacing, data collection and quality improvement initiatives. The #C2C Movement: Mission & Purpose. 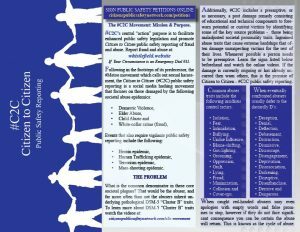 Citizen to citizen (#C2C) public safety reporting “action” purpose is to facilitate enhanced public safety legislation and promote Citizen to Citizen public safety reporting of fraud and abuse. If Your Circumstance is an Emergency Dial 911. The Citizen to Citizen (#C2C) public safety reporting is a social media hashing movement that focuses on those damaged by the following societal abuse epidemics: • Domestic Violence, • Elder Abuse, • Child Abuse and • White-collar crime (fraud), Events that also require vigilante public safety reporting include the following: • Heroin epidemic, • Human Trafficking epidemic, • Terrorism epidemic, • Mass-shooting epidemic. What is the common denominator in these core societal plagues? That would be the abuser, and far more often than not the abusers inherit underlying pathological DSM-5 “Cluster B” traits. To learn more about DSM-5 “Cluster B” traits watch the videos at: citizenspublicsafetynetwork.com/c2c-movement Additionally, the #C2C technology includes a preemptive, or as necessary, a post damage remedy consisting of educational and technical components to forewarn potential or current victims by identifying some of the key source problems - those being maladjusted societal personality traits. Ingrained abuse traits that cause extreme hardships that often damage unsuspecting victims for the rest of their lives. Whenever possible a person needs to be preemptive. Learn the signs listed below beforehand and watch the online videos. If the damage is currently ongoing or has already occurred\ then warn others, this is the premise of Citizen to Citizen; #C2C public safety reporting. Copyright © 2018 Citizen's Public Safety Network (CPSN). Some rights reserved. Non-commercial use of text and images in which CPSN holds the copyright is permitted, with attribution, under the terms and conditions of a Creative Commons License. This website and vulnerable person task force software (VP Task Force ™) was developed by Altruesoft ® in partnership with the Citizen's Public Safety Network in Coeur D'alene, Idaho. CPSN is dedicated to reducing the negative impact of those whom present a public safety risk by their repeated exploitation of vulnerable persons, senior citizens, those with disabilities, children, victims of domestic violence, person crimes, civil rights violations and related crime — those whom have had their civil and inalienable human rights violated. All persons whom are constitutionally protected under Federal Acts, State Statutes, Municipal Codes, Occupational License Ethics and Industry Regulations. The #C2C Movement began in Coeur d'Alene, Idaho and Spokane Washington. #C2C’s aim is to mitigate the damage of elder abuse, domestic violence, child abuse and all persons affected by white collar-crime (fraud), malpractice, business, professional and facility violations.